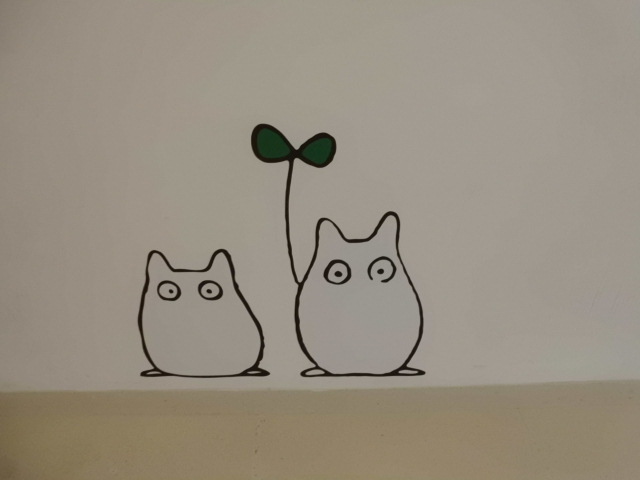 Today, my husband and I went to the Studio Ghibli Layout Exhibition at the Okinawa Prefectural Art Museum. It was so interesting! 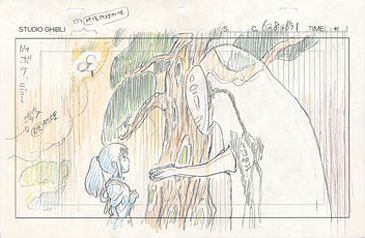 Hayao Miyazaki made beautiful layouts. All of the works featured were from Studio Ghibli’s last fifty years. Works as early as Lupin the Third (1971) and Sherlock Hound (1984) stood among more modern works like Ponyo (2010) and Spirited Away (2001). Though exhibition showed many of Miyazaki’s works, other directors under Studio Ghibli also shared the spotlight. 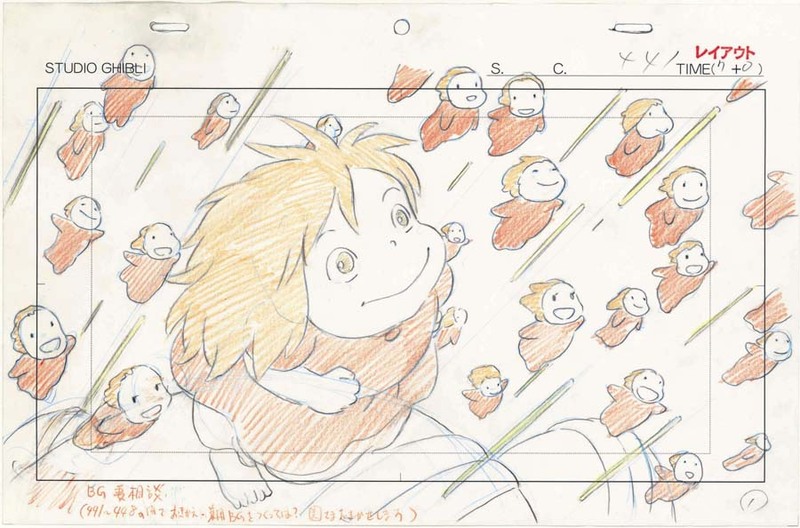 Studio Ghibli’s co-founder, Isao Takahata, showcased layouts from My Neighbors the Yamadas (ホーホケキョとなりの山田くん, 1999), Heidi Girl of the Alps (アルプスの少女ハイジ, 1974), and Grave of the Fireflies (火垂るの墓, 1988). 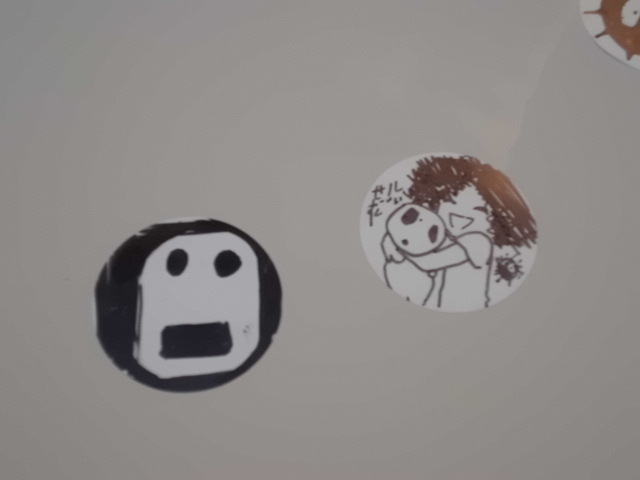 At the end of the exhibition, everyone could make a black-and-white drawing on a sticker and put it on a wall. 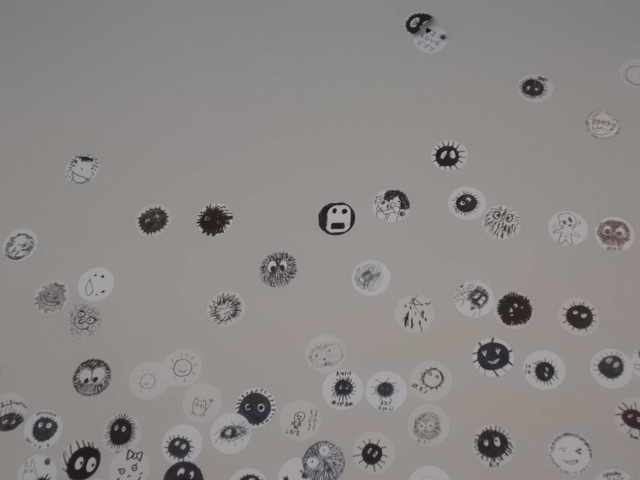 There were hundreds of stickers on the wall! 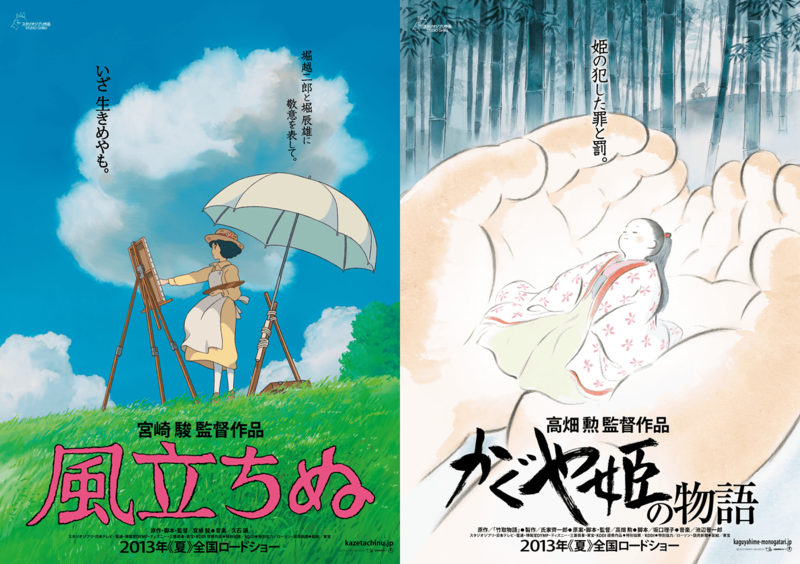 The next Studio Ghibli animations set to come out this year are The Wind is Rising (風立ちぬ) and The Tale of Princess Kaguya (かぐや姫の物語). Picture of the new anime coming out this year (from Gigazine). This entry was posted in Anime (アニメ), Art (芸術) and tagged かぐや姫の物語, アニメ, アルプスの少女ハイジ, スタジオグリレイアウト展, ホーホケキョとなりの山田くん, Blubber Island, 火垂るの墓, 風立ちぬ, Grave of the Fireflies, Hayao Miyazaki, Heidi Girl of the Alps, Isao Takahata, Japan (日本), Japanese, kodama, Layout Exhibition, Lupin the Third, My Neighbors the Yamadas, Okinawa Prefectural Art Museum, Ponyo, Princess Mononoke, Sherlock Hound, Spirited Away, Studio Ghibli, The Tale of Princess Kaguya, The Wind is Rising, 千尋の神隠し, 日本語, 沖縄県立美術館. Bookmark the permalink. How cool, I love that they let the fans contribute. Your stickers are so cute. Thank you! I think they’re touring this exhibition everywhere in the world (I think saw some posts in China and Korea).